DISCLAIMER: This is a one way process and all steps must be taken to ensure that data is backed up before attempting. The author is in no way responsible for loss of data or damage to disk, data, and the computer as a whole. 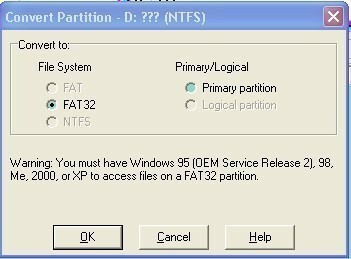 FAT : File Allocation Table is a computer file system architecture that Bill Gates and Marc McDonald developed in the late 1960s and 1970s. 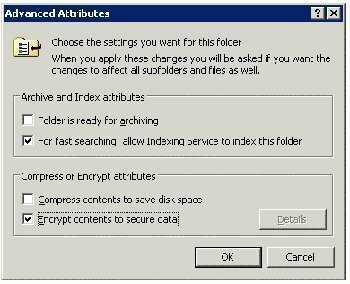 It is the main file system in use for MS-DOS and the earlier versions of Windows up to but not inclusive to Windows NT. 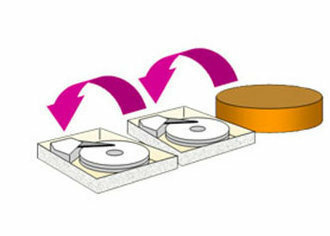 NTFS : New Technology File System is a relatively new file system that Windows NT, server 2003/2008, XP, and Vista use. It is more powerful than the FAT system and employs newer security features and enhancements. Backup all important files and folders to an external hard drive or DVD. Click Start -> Run -> Type cmd in the box -> Press enter. By now the command prompt should have opened up. The command prompt is the black screen with white text. A name and a serial number will be displayed on the screen. Make a note of the names. Now type convert (drive letter) /fs:ntfs. If the operating system is on the drive to be converted, the program will ask if it should schedule the conversion for when the system is restarting. Click Yes to do so. The type of file system is FAT. Enter the volume name noted earlier and press ENTER. Once the conversion process is complete, quit command prompt by typing exit and pressing enter. Congrats on the new improved NTFS drive!! this is great… thank you! Followed your steps and it worked perfectly for me. Thanks! Please help, thanks a lot! This was responded to above, check this article. And now I can transfer files larger than 4 Gb to the disk ! my data in the suppose D drive lost .means volatile/erased for ever.? and this becomes new empty drive? See here. 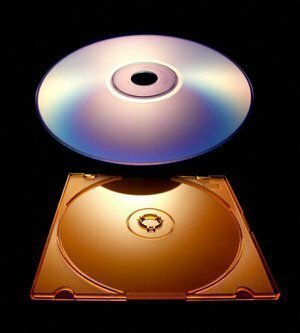 You should probably run some checks on your disk. Depending on the operating system, it should be easy, but just be aware, that when you change it from FAT32 to NTFS, you will lose all of your data, so save the data on the external drive to somewhere else before you do this. This is all from memory (but I used to do it a lot), so it may be a little off, but it should give you an idea. I am not sure if Vista/Windows 7 is the same, but if not, if you go to the control panel, you should be able to find the disk manager. After it is deleted, right click on it and chose “create partition”.. Try running the Command Prompt as administrator. When you go to Start > Programs > Accessories > Command Prompt instead of left clicking on Command Prompt right click it and choose “Run as Administrator”. Then do the commands as instructed and it should work. great post.I followed the above procedure and I got my drive converted without any problem. 148 queries in 0.605 seconds.